A decade after launching the Yoga Retreat for Women of Color, Maya Breuer will help roll out the first Yoga Retreat for Mandarin-Speaking Women this spring in New York. 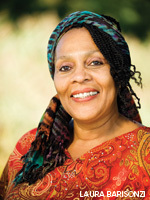 She has collaborated with the Boston Medical Center to help low-income people reduce back pain through yoga and worked with Brown University to introduce African American women to yoga. As an African American Jew, she has felt exclusion keenly, which inspired her “unity within diversity” view of yoga. When did you first connect with yoga? In the early 1980s at the Kripalu Center for Yoga & Health [where she is now on the board of directors]. It was a difficult time: I had three teenaged children, was beginning a recovery program for alcohol abuse, and healing from cancer surgery. In addition, I was caring for a brother battling AIDS. After years of practicing, my true life began to unfold. The practice of yoga did for me what no substance, doctor, support group, family member, friend, or lifestyle change could do. Yoga introduced me to my inner Self. How did your studies in India affect you? In 1988 I fully immersed myself in the lifestyle and practice of a yogi. I followed mitahar, a restricted diet. For three months I lived in the village of Kayavarohan in Gujarat, India, and received instruction in prayer, chanting, asana, and yoga philosophy under Sri Rajarshi Muni. Today I incorporate those into my teaching, which includes people from all cultures, socioeconomic backgrounds, religions, races, ages, and philosophies as well as people coping with chronic illness, stress, and behavioral challenges. Why did you launch the Yoga Retreat for Women of Color? I wanted to introduce minority women to the healing benefits of yoga practice, provide them with an outlet for their stress, and teach them ancient wisdom. Each retreat attracts women from all ethnicities. It’s my firm belief that the awareness and skills one derives through yoga practice will greatly benefit the black American community. What type of students are you drawn to teach? I’m drawn to those who need yoga to help them change their lives after loss, grief, stress, or challenge. In 2001 I founded the Santosha School of Yoga, in Warwick, Rhode Island. I run certification programs for the general population as well as for those seeking to work with victims of domestic violence, people in recovery, and women living in shelters. In the last couple of years, I’ve certified eight Spanish-speaking women who are now teaching in their native language. It’s my dream to have a yoga instructor in every community to help fight the lifestyle challenges that affect them.